The 2014 Chevy Silverado has been redesigned by GM and the focus is on fuel efficiency, power, and value. The last two of those characteristics have long been pick-up truck traits, but lately, every vehicle has to have a strong focus on improving fuel efficiency and Chevy is making strides in that direction. Chevy has also upped the ante in cost of ownership and convenience. The 2014 Silverado is able to achieve up to an estimated 23 mpg highway – with a V8 in 2WD trim. That range of fuel efficiency is new for trucks. In fact, compared to the outgoing Toyota Highlander in its popular V6 and AWD configuration, the Silverado with a V8 and 4WD has the same highway fuel economy at 22 mpg. Chevy makes the bold claim that the V8 Silverado is more fuel efficient than the Ford F-150 with the EcoBoost V6. The Silverado uses many different technologies to achieve this, but its cylinder deactivation is the real key. It uses only 4 of the 8 cylinders in its EcoTec3 engine when cruising at low load, highway speeds. Like most automakers, GM has new names for the engines in its line-up and the 2014 Silverado’s engines are dubbed EcoTec3. The rumors that GM consider “Big ‘n Thirsty” and “Carbon Shooter” are totally unfounded. These names give a pleasant environmentally friendly tag that is much more palatable than Honda’s “Earth Dreams.” The most efficient EcoTec3 engine is the 4.3 liter V6. The volume engine will be the 5.3 liter V8 mentioned above, and the big daddy is the 6.2 liter V8. Hybrid drivetrains were dropped last year due to complete disregard by the buying public. The new 5.3 liter engine will have 355 horsepower and 385 pound-feet of torque. Chevy considers this to be class competitive with Ford’s very popular 3.5 liter twin turbo EcoBoost engine that has both more power and more torque, but not much more. The transmission is a six-speed automatic. Commenting on the drivetrains in the new Silverado Jeff Luke, executive chief engineer for Silverado said “Silverado’s available 5.3-liter EcoTec3 V-8 gives customers the best of both worlds. Customers get the proven power and dependability of a V-8 truck engine, with better fuel economy than a leading competitor’s smaller turbocharged V-6.” Yes it can tow the same 11,500 pounds of giant boat or work trailer that the F-150 can. 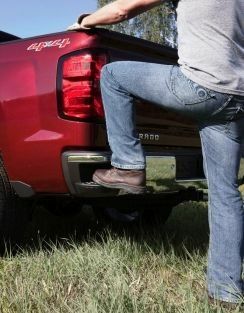 In addition to the fuel economy gains and the new slightly different look, the Silverado added a stronger quieter cabin. The way that was achieved is interesting. Click here for details on that. Folks using the truck as a work vehicle (let’s not pretend that is what all buyers use trucks for) will be happy with the new CornerStep bumper and standard rail protectors for the bed box. We hate to point out the obvious, but a lot of trucks have that spot on the bumper damaged by turning a trailer too sharply. Maybe Chevy has that problem sorted. In order to boost the value of its trucks, Chevy will now offer free maintenance for 2 years or 24,000 miles. That includes all the things in the owner’s manual required and covers the first four scheduled visits. This is something one might expect from a German luxury automaker, not a domestic pickup truck manufacturer and it may just start a trend. Would anyone like to bet that the 5th scheduled maintenance visit will be a wopper of a wallet hit? Please pardon the cynicism, but we have noticed a huge coincidence with oil changes jumping from 3,000 to 10,000 miles or more when automakers start including oil changes in the car’s price. The regular cab 2014 Silverado will start at just $24,585. That does not include the dealership’s “Doc” fees or other add on fees and taxes. According to the Chevy “build your own” website the 2013 Silverado’s MSRP including destination freight charge would be $25,570. So unless we are comparing the base trucks wrong the new models at first seem to be less expensive. However, Chevy is offering “$2,500 cash back” on the 2013s now. So in the actual dealership it would seem the buy price will be less for a 2013 than the coming 2014. Almost nobody will pay that for a Silverado. 2WD base regular cabs are rare. We configured a 2013 Silverado Crew Cab with short box, bedliner, trailer package, bucket seats and in LT mid-level trim and came up with an MSRP in the low $41K range. Expect the 2014 to be very close in price to that popular configuration. The 2014 Chevy Silverado and 2014 GMC Sierra are very similar in looks to the outgoing models. For a good side by side shot click here. For a photo gallery of the 2014 this is your link. The 2014 Silverado will be available in about 2 or 3 months.